In its 30th year, FOL counts nearly 2,000 individuals and organizations as members, including Liberians and persons living all over the world who care about Liberia. The following summary does not include all activities of FOL, but demonstrates the influence and impact FOL has had assisting Liberians progress toward a sustainable, accountable, transparent democracy based on health, education, and a vibrant economy for all. Click the blue subscribe button at the bottom of the page to get regular updates! Friends of Liberia was founded as an alumni group for former Peace Corps Volunteers. FOL worked to bring to the attention of the world the desperate plight of Liberians caught up in the serial violent conflicts that kept a generation from regular school attendance, displaced at least a third of the population, killed an estimated 250,000, and left innumerable scars on survivors as well as destroying resources and infrastructure. FOL officials testified before Congress twice about conditions during the long wars. FOL was a member of Project Liberia, a consortium of American organizations committed to providing support for peace, free elections, and democracy in Liberia. During Liberia’s civil war, FOL committed over $100,000 in publicly raised funds for direct relief to Liberian refugees in Côte d’Ivoire and Sierra Leone, and to displaced persons and orphans within Liberia. FOL also provided medical equipment and supplies to hospitals in Liberia. FOL sponsored a public forum in Washington, D.C. on the future of Liberia and brought together high-ranking representatives from all sides of the Liberian conflict for the first time in the United States. July 1991 – FOL’s video documentary on the war in Liberia, “The Path to Peace,” provided many Americans their first glimpse of the war and its effect on the Liberian people. FOL sends member Dr. Meda Colvin to Liberia for two tours of duty in Monrovia hospitals. FOL hosts several interim presidents of Liberia at the U.S. Capitol on visits to the United States and testifies before congressional hearings on Liberia. FOL president takes fact-finding trips to Liberia to attend political conferences and report to membership and Congress. FOL was instrumental in the establishment in the United States of Temporary Protected Status for Liberians. FOL begins sending Liberian news to members and others by e-mail; the free “news service” attracts many who are not members of FOL, but who need news of Liberia for various reasons. The “news service” becomes a powerful advocacy tool. FOL is awarded the National Peace Corps Association’s annual Loret Miller Ruppe award for its remarkable emergency relief assistance and peace and institution building. FOL, in cooperation with the Carter Center, the Institute for Multi-track Diplomacy, and George Mason University’s Institute for Conflict Analysis and Resolution, sponsored a conflict resolution workshop in Akosombo, Ghana, for representatives of a dozen of Liberia’s warring factions. FOL, in cooperation with the Carter Center, the Institute for Multi-track Diplomacy, and George Mason University’s Institute for Conflict Analysis and Resolution, sponsored a conflict resolution workshop in Abidjan, Ivory Coast, for representatives of a dozen of Liberia’s warring factions. FOL’s Communities Nurturing Children (CNC) reconstructed a health clinic in Owensgrove and a school building in Johnsonville with members of those communities. March 1996 – FOL rallies at the U.S. Capitol in support of U.S. intervention to stop the Liberian civil war. FOL publishes “Liberian Cookhouse Cooking,” a compilation of recipes from members and Liberians in the U.S., with proceeds going to the Communities Nurturing Children project. July 1997 – With USAID funding, FOL sent 34 of its members as part of the international observer force for the Liberian presidential election in 1997. In collaboration with the New African Research and Development Agency (NARDA) and funded through grants from the United States Institute of Peace and the African Development Bank, FOL coordinated planning for an non-governmental organization (NGO) conference held in Monrovia to develop a post-conflict plan for reconciliation and development. FOL administered the African Women and Peace Support Group’s project to document Liberian women’s peace actions. The project was funded by the UN Office for Project Services (UNOPS). The local partner was the Liberian Women’s Initiatives and Actions for Peace project. FOL helped to refurbish the Sugar Hill School, created from a marketplace in Gbarnga. May 1999 – FOL collected and shipped books from the Federal Law Library and computers donated by the Harvard Law School to the Arthur Grimes Law School at the University of Liberia. FOL coordinated the Liberian Education Assistance Project (LEAP) with the help of private foundations and sent experienced U.S. teachers to hold three-week in-service workshops for primary school teachers and principals, even while civil conflict escalated. Working with the Ministry of Education and UNICEF, LEAP’s local affiliate, the LEAP Extension Team (LET), shared methods of teaching and content with teachers of K-3 classes in five counties. FOL sponsors the formation of the Liberian Educators for Action and Peace (LEAP), a Liberian non-governmental organization dedicated to teaching teachers of kindergarten through grade three the interactive teaching methods learned in FOL LEAP workshops. Liberian Women’s Initiatives and Actions for Peace Project published a book documenting Liberian women’s peace efforts. This project was designed by the African Women and Peace Support Group, funded by the UN Office for Project Services (UNOPS) and implemented by FOL. FOL funds African Children’s Libraries to ship a container of books to Liberia and send a trained librarian to teach schools how to maintain a library. The organization has set up more than a dozen children’s libraries, mostly in rural Liberia, and trained school librarians. FOL officers meet with the Peace Corps staff in Washington to encourage the return of the Peace Corps to Liberia. In March 2008, the Peace Corps announced that Peace Corps Response would send 18 volunteers to Liberia to work in the education sector. 2008 – FOL Small Grants Program funds its first projects. Several of the non-profit groups were assisted in applying by members of the first Peace Corps Response team in Liberia, the first Volunteers since war had caused Peace Corps to withdraw 18 years previously. Grants support post-war mediation, a shipment of books, teacher training and in-service on various levels, a health care feeding program, and educational materials and furniture. FOL publishes the second edition of Liberian Cookhouse Cooking, a compilation of recipes from FOL members and Liberians in the U.S., with proceeds of this edition going to the Small Grants Program. 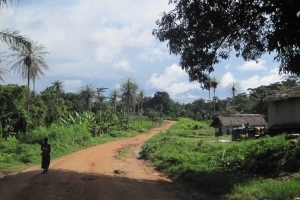 May 2009 – Twenty-seven members of FOL travel together at their own expense to Liberia to do volunteer work in the areas of health, education, and the environment. In addition, the travelers attend the first Liberian Studies Association conference held in Monrovia, visit women’s market places, meet with Peace Corps Response Volunteers, inspect FOL small grant projects, and meet with the President of Liberia and the U.S. Ambassador to Liberia. 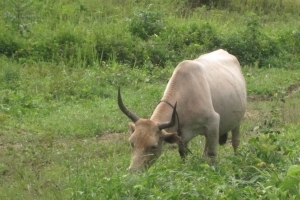 Approximately $24,500 was awarded by FOL to NGOS to advance 14 projects, including textbooks for schools; completion of a library; computers and cabinets for faculty at a nursing school; purchase of a rice mill by a farmer’s cooperative; assistance to buy a farm for a teacher’s training school; provision of a post-war wildlife survey; workshops and in-service training at a regional hospital; shipping of bicycles provided by another NGO; funding a literacy program led by students after being taught how by educators and community leaders; a women’s association training program; a kiln for a potter’s association; and provision of scientific calculators and training in many high schools and universities. May – FOL President Stephanie Vickers visited five of the FOL funded Small Grants Program sites in Liberia for monitoring and support. Approximately $23,000 was awarded by FOL to NGOs in 2010, including programs that provided materials for a new kitchen in an orphanage; trained destitute youth in life skills, teamwork, and leadership through soccer; assisted a primary-age literacy project; built a community well and school water system; restocked a pig farmer’s cooperative; purchased materials for a new school adopting FOL’s LEAP teacher training methodology; partnered with other NGOs to provide voting workshops for women; improved drinking water in several communities; purchased two motorcycles for independent journalists; provided renovations and equipment for schools, including one for the disabled; and provided skill and entrepreneurial training to young adults. June – the first regular Peace Corps Volunteers start their training in Liberia, twenty years after the Peace Corps left Liberia. Peace Corps Volunteers were sworn in August 27. FOL awarded twelve (12) Smalls Grants totaling $23,218 to Liberian non-profit organizations to develop a new farmers’ association and production; refurbish a library; supply instructional materials for a K-3 teacher-training workshop; partner in construction and staffing of a hospital to reduce infant and maternal mortality; partner with another NGO to restart quilting production; enhance a farming operation that generates scholarships; train students and instructors in gardening and implementation for self-sustenance; introduce beekeeping, snail raising and Moringa production for Liberian women in one county; support mother tongue survival and literacy by helping bind books written in indigenous languages; develop a library in an isolated area and another associated with a teacher training institute; support development of an independent radio station in northern region pre-election and beyond. FOL held three events with over 450 participants during the 50th Peace Corps Anniversary Celebration in Washington, DC in September, 2011. Speakers included U.S. Ambassador Linda Thomas-Greenfield, Liberian Ambassador William V.S. Bull, Sr., Peace Corps Deputy Director Carrie Hessler-Radelet and Liberian Vice President Joseph N. Boakai. FOL awarded seven Small Grants totaling $13,967. These support a computer and entrepreneurship program for women; provide desks for a K-4 school in the eastern region and instructional materials for math and science teachers at different schools; convert a plot to a rice farm for youth to learn and maintain; support a sewing program at two market sites; train teachers in computer technology and supplying materials; train 25 unemployed youth in life skills and baking, with plans to expand to media drug awareness and other programs. FOL developed and adopted a Strategic Plan to guide its activities and project decisions in the future. Meanwhile, FOL awarded four small grants totaling $5300. Funding helped establish a sewing/tailoring project for disabled females; provided partial costs for expansion of solar panels at a school; supported a program for victims of sexual violence; and boosted a girls’ self-help purse-making project that enables them to stay in school. Please refer to the 2014 Annual Report for important details. Prior to the outbreak of the Ebola Crisis, grants were awarded to stimulate entrepreneurship among women in sewing and cosmetology; construct beehives and train youth in production; provide high school students with entrepreneurship skills; assist in construction of a well for an education center; provide medical equipment for clinics in underserved areas; and provide textbooks for a new school. Additionally, in the U.S., a program to place donated Liberian artifacts in appropriate institutions was developed and FOL implemented a mentoring program available to recent PCVs. The onset of the Ebola Crisis closed schools and affected on-going programs in Liberia. Peace Corps Volunteers were withdrawn. By July 2014, Ebola projects were being supported by FOL and fund-raising in the U.S. to further support efforts became a priority. By the end of 2014, FOL members and supporters had raised over $100,000 to help address the crisis. Assistance went to MSF (Doctors Without Borders); Global Health Ministries for essential isolation-related materials; and to known clinics, a hospital, and school and community health programs that both supported patients and addressed prevention of Ebola transmission. A Post-Ebola grant committee developed guidelines for more effective evaluation of proposals and funded programs, utilizing FOL members in Liberia when possible. 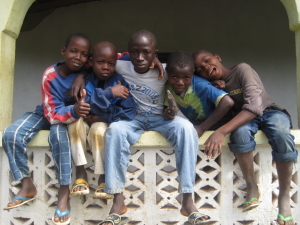 Remaining Ebola funds resulted in grants that include construction of a pump well in a male dormitory; ongoing psychosocial support to Ebola orphans; nutrition and hygiene curricula plus teacher training in eastern Liberia; and a program to establish water, sanitation, and hygiene clubs and training in schools in two counties. Some dedicated funds remain for post-Ebola-related projects in 2016. Small grant awards supported an NGO that promotes sustainable community change, civic participation, collaboration, accountability, and integrity; development of a sound waste management system and small worker stipends in a very underserved community; and development and dissemination of radio messages to reintegrate Ebola survivors into families and communities without stigmatizing them. Other grants helped build a caretaker center near a major hospital; enlarged a women’s skills-training program for self-support; and provided school materials, tuition, and counseling for children and caretakers affected by Ebola. FOL experts researched early childhood learning programs and selected the HIPPY model (please refer to FOL website) for its Family Literacy Initiative (FLI) pilot project. The successful Liberian NGO “We-Care” was selected as its implementing partner. Proposals were developed to involve funding partners, implementation procedures were developed with HIPPY advice, and by the end of the year the Government of Liberia (GOL) had given its blessing. Implementation of Phase I of the Family Literacy Initiative (FLI) began through its Liberian partner, with oversight of training from the international HIPPY director and FOL early childhood expert. Identification of potential funding partners continues. Two small grants were approved in January. One will fund a survey of nursing school instructors in numerous Liberian nursing and midwifery schools to assess training and in-service education needs of medical personnel. The goal is to develop a FOL and GOL-supported sustainable program of continuing education for medical personnel, which is currently absent. The second grant will provide funds for sewing machines for graduates of a training program serving vulnerable women. They must repay the training program from earnings, then the program buys machines for the next graduates and thus becomes sustainable.